The 10 Best Places for Pancakes in West Virginia! Who doesn’t love the taste of hot pancakes right off the griddle? Douse it in sweet syrup and you have a heavenly breakfast. 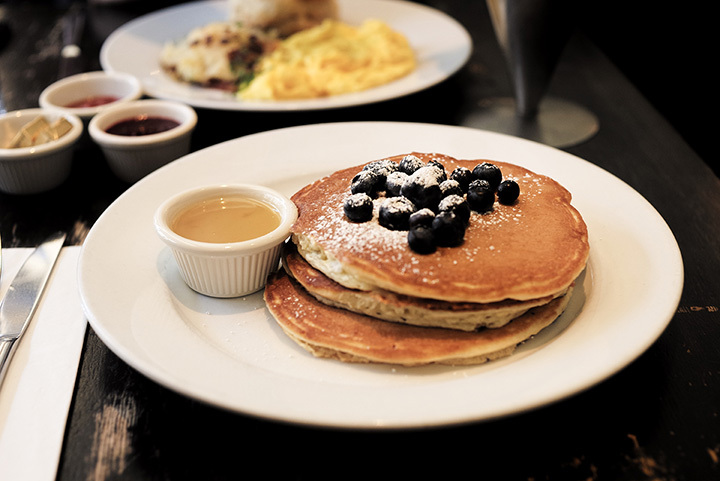 Pancakes are a delicious breakfast treat. Visit any of these West Virginia restaurants for a delicious stack of pancakes! Known for having delicious comfort food like mashed potatoes and burgers, Scottie’s in Elkins, West Virginia, combines homemade food and family style dining with excellent customer service that makes a winning combination. For more than 20 years, Scottie’s has been the go-to place in this area for breakfast, lunch, and dinner featuring menu items like the biggest buttermilk pancakes and daily specials like chicken pot pie and brown beans and cornbread. If you’re looking for a breakfast experience, you have to stop by John’s Family Restaurant in Charles Town, West Virginia. With delicious menu items like creamed chipped beef over biscuits and grits, fluffy omelets, and pancakes the size of your plate, John’s is open every day but Sunday. The only question you’ll be asking is why it took you so long to visit. If you’re visiting historic downtown Harpers Ferry, West Virginia, and you want a great place to eat, make sure to put the Country Café on your list. Open for breakfast and lunch every day from 7:30 a.m. to 3 p.m., the award-winning Country Café offers great food at great prices. Treat yourself to a true country breakfast with 3 pancakes, your choice of egg, and bacon or sausage. Lunch features a variety of hot and cold sandwiches, soups and salads, and several different foot long hotdog specials. With breakfast served all day long, the Mountaineer Family Diner is back in business after a period of being closed. Under new management, the diner offers all your favorite traditional breakfast fare like bacon, ham, and sausage, biscuits and gravy, eggs any style, pancakes, waffles, and fried potatoes. The lunch menu has some of the best onion rings and burgers around, and if you’re still hungry, top off your meal with a slice of fresh coconut cream pie. Natural ingredients set the stage for this farm-to-table restaurant that puts a twist on traditional breakfast items. Inspired by the country cooking found in Appalachia, you’ll find fresh, daily-prepared menu items like breakfast potato skins, bagels and lox, shrimp and grits, corned beef and hash, a variety of daily quiche specials, and your favorites like biscuits and pancakes. Brunch is served on weekends only, but breakfast and lunch are available Monday through Friday. Like something out of a colonial setting, the Livery Tavern in Lewisburg, West Virginia, is the ultimate in comfortable dining. With an unparalleled menu featuring dinner and small plates, the brunch menu offers corned beef, fluffy buttermilk pancakes, bacon, sausage, eggs Benedict, omlettes, and many lunch items. Named for the livery stables that once stood on the same spot, The Livery Tavern is making a name for itself by the food prepared and served there Tuesdays through Sundays. What began as a boardinghouse for lumberjacks in the late 1800s is today a peaceful inn nestled in the Monongahela National Forest. Bright Morning Inn, located in Davis, West Virginia, is a home away from home for hikers, mountain bikers, skiers, birdwatchers, and outdoor lovers who come to enjoy the beautiful and scenic mountains of the state. Overnight guests will be treated to a wonderful breakfast of bacon and eggs, biscuits and gravy, omelets, and extra fluffy pancakes served with locally sourced honey and maple syrup. Open to the public for breakfast only, you can have a bright morning Thursday through Monday. Given solid reviews by social media food sites like Yelp, the Hall of Fame Café located in Wheeling, West Virginia is a homey family restaurant that’s small in size but large in good eats and great prices. Right on the corner of 20th and Market Streets near the historic part of downtown Wheeling, you can order your favorite breakfast, lunch, or dinner items like traditional pancakes, bacon, and eggs, fresh made soups and salads, and five-star burgers and fries. Large portions and fast friendly service make it even better, and the café is open Monday through Friday. You’ll get the B.E.S.T Breakfast at the Bridge Café and Bistro in Hurricane, West Virginia. Featuring Bacon, Eggs, Sausage, and Toast, if that’s not to your liking, you can also get gluten-free pancakes with pulled pork sweet potato and sriracha maple syrup, bacon banana PB&J pancakes with blackberry syrup, sweet potato pancakes, or a stack of traditional fluffy pancakes. You can add several a la carte items to your meal like eggs, sausage, hashbrowns, bacon, and biscuits or toast. Morgantown, West Virginia is the location of Morgan’s High Street Diner, a tribute to the downtown city. Social media reviews talk about crispy French fries, chocolate chip pancakes, and the best in comfort food. Breakfast favorites also include the Motown Irish Benedict made of Texas toast, corned beef hash and a sunny side up egg and Chicken Fried Steak and Eggs with home fries and biscuit. Stop by any day but Monday from 8 a.m. until 3 p.m.